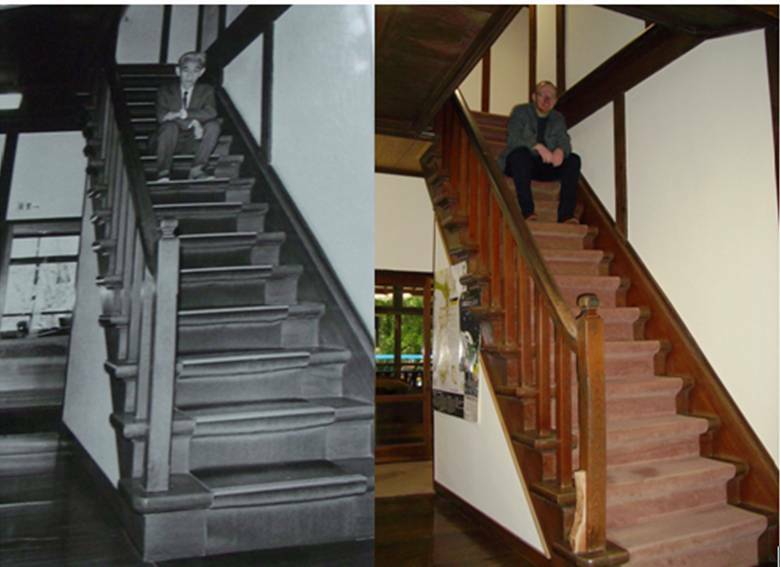 I can’t believe it has been ten years since I made this particular journey. The memories are so fresh it feels like it was just yesterday. I’m always reminded of this journey at this time of year, whenever I hear the sound of a sudden summer cloudburst pattering on the green leaves of tall tress. Without a breath of wind, the gentle yet intense sound of the rain the only thing breaking the stillness of the warm, heavy air. It’s like an echo in time. On 8th June 2005 we set out from Tokyo on the ‘Odoriko’ train bound for Izu. The Izu Peninsula is only a short distance west along the coast, originally formed from the ancient lava flows of nearby Mount Fuji. Izu is an idyllic spot, relatively sparsely populated given its close proximity to the vast megalopolis of Tokyo, it has a jagged coastline looking out over a beautiful turquoise sea, and the hills inland are covered with lush forests of maple and beech tress. It is a famous place for its hot springs, or onsen 温泉, of which there are said to be around some 2,300 or so. Our first stop was the coastal town of Atami. A short bus ride up the steep hillside took us to the MOA Museum of Fine Art. To reach this very modern museum building you have to ride a sequence of escalators which ascend within the hillside itself. The fact that we were the only people travelling up enhanced the serene yet surreal sense that we were ascending into some sort of parallel dimension, yet at the top we emerged once again to a spectacular view looking down the steeply raked hillside to the sea. The museum has a wonderful collection of ancient art, including a reconstruction of a famous golden tea room, based on an original tea room from 1586, in which Lord Toyotomi Hideyoshi entertained the Emperor Ogimachi. The museum itself is set amongst very beautiful grounds, with its own noh theatre stage, and it also has a small pond outside with water lilies growing within which originally came from the garden of French Impressionist painter, Claude Monet in France. Here at Atami we stayed in a traditional ryokan 旅館, or family-run inn. This one was particularly special as in addition to the main ryokan building, with its large indoor ofuro お風呂 and outdoor rotemburo 露天風呂, or communal baths. It also had a few small, traditional-style wooden cottages tucked away amidst a garden which was carefully laid-out and quite ingeniously styled to make each cottage feel wonderfully secluded, even though the grounds couldn’t have been altogether very extensive in such a tight urban space. Rather than taking a room in the main lodge we took one of these little cottages. Inside it was quite spacious, with tatami 畳, or woven-grass mat floors; shōji 障子, light sliding paper-screen doors, and its own small bathroom with piped onsen water. This ryokan was my first experience of a hot spring spa, and it was a revelation – it might sound daft, but I’ve never experienced water so thoroughly hot before! … It’s hard to describe adequately in words, but there is something almost supernatural about water which has been heated by subterranean thermal vents and then filtered through volcanic rocks before reaching the surface, still scalding hot, its steam scented with minerals and salts drawn from deep within the earth. I’m quite sure there is nothing which can ease and relax all the tensions from your muscles quite like the waters of a good hot spring! – That, combined with the perfectly honed hospitality of a traditional ryokan, is a real escape from the everyday ... A long soak in the hot waters, leaving you feeling relaxed and cleaner than ever before, followed by a beautiful and exquisitely presented feast, all freshly prepared with a careful combination of dishes, immaculately served, and washed down with a few cups of chilled sake will set you up perfectly for the night as you simply melt into the crisp covers of your futon 布団, breathing in the sweet aroma of the tatamifloor all around you. I was out like a light! The story begins at the very ryokan in which we were staying. The narrator, a young 20 year old student on a solitary walking holiday, meets a troupe of travelling entertainers from Oshima Island on the road. 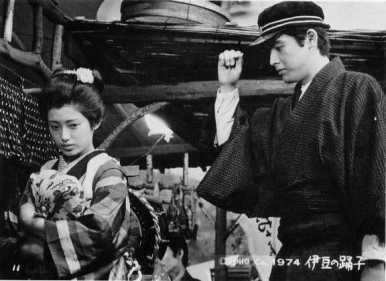 They become travelling companions, continuing on together from here to the coastal port town of Shimoda. 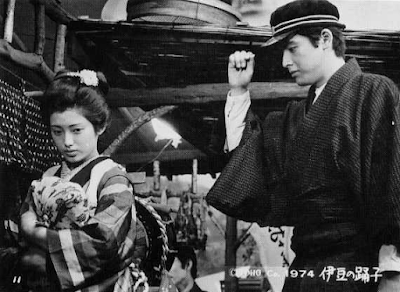 One evening, whilst sitting on the stairs of the ryokan, he watches the youngest girl of the troop – ‘The Izu dancer’ – performing, and falls quietly in love with her. But as with so many of Kawabata’s stories the love is an understated and unspoken one, a silent romantic awakening which brings a kind of inner transcendence through both the joy and the pain of unfulfilled longing. It is a touching and much loved ‘coming-of-age’ story. Kawabata used to be a regular guest at this ryokan which is decorated with old sepia-toned photographs of him. His favourite room, which he always used to stay in, has been preserved and is now filled with his books and mementos of his most famous short story which, so the proprietors say, was inspired by actual events that took place here at this very inn. – Yasunari Kawabata, The Dancing Girl of Izu (1925). 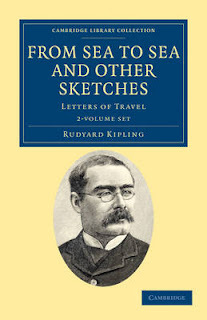 – Rudyard Kipling, From Sea To Sea (1900). After a hot soak and a lavish feast in our room, which again was made up in the traditional Japanese style with tatami mat floors, sliding shōji screens and low tables, once the sun had set, we ventured out for a stroll. We had picked the right time to stay because that evening was the night of the annual firefly festival, the first night of the year when the fireflies magically emerge and take wing. A short distance down the hill from our ryokanthere is a little island in the river which is joined by two bridges, one to each bank and renowned after a local legend of two forbidden lovers coming across the bridges to meet on the island in the middle. We were given a small paper lantern on a stick with a small candle inside by the little old lady who ran the ryokan with her family and set off into the night. Walking on getais an acquired skill. It doesn’t take long to get the knack though, especially if you picture yourself as moving your feet and legs in the very deliberate manner a child’s clockwork toy-robot! Crossing the bridge to the island was a beautifully ethereal experience for me. It was as though I had stepped through a time-warp back to the Edo Period, as everyone there (including me) was dressed in their yukata, the patterns of which made it easy to discern how many different ryokan there were nearby. Through the stark black silhouettes of the tall trees we could see the stars twinkling high above, but down here in the pitch black shadows of the looming trees we could see the faint wavering trails of the fireflies, green glowing dots of light, like small constellations of wandering stars emerging both near and far. Gradually multiplying in number as the fireflies began to come out, their strange green lights flickering and fading in-and-out of varying degrees of brightness. As our eyes adjusted to the darkness we could see more and more of them. People were putting out their hands, gently encouraging the fireflies to take a momentary rest on their outstretched fingers. I was amazed at how big, black and ugly they were when someone lit a torch to take a closer look. Over on the far side of the other bridge a small local TV News crew periodically lit up a large arc lamp for a few moments to film the people milling about the island in their yukata, it was then that I realised I was the only westerner and indeed the only non-Japanese there. 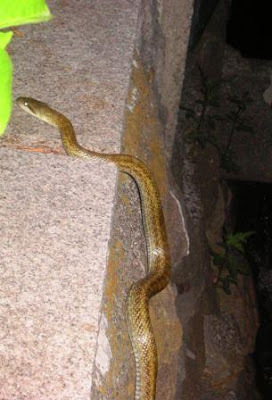 After a while of watching the hypnotic dance of the fireflies over the rushing waters of the river amidst the gentle, murmuring rustle of the leaves overhead we began the climb back up the hill to our ryokan, where we went for a late night dip in the rotemburo. It was even more magical lying in the hot water with the surging flow of the ink-dark stream swirling passed on a level with the rock-lined bath, lying back and looking up to the bright stars through the dappled blackness of the maple leaves overhead, with an occasional stray firefly glinting through the arboreal darkness. When we awoke the next morning I remember thinking I’d never felt so relaxed in all my life. The combination of bathing in the hot onsen with the scent of the tatami floor and the hinoki 檜 (Japanese cypress) and sugi 杉 (Japanese cedar) wood timbers of our room’s interior décor was wonderfully calming. 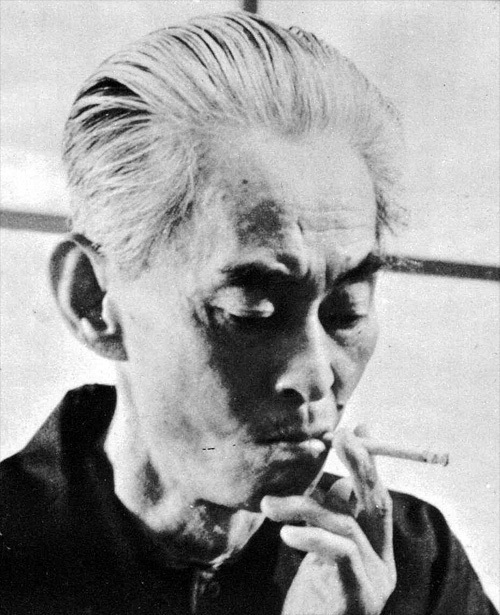 I lay there reading Kawabata’s words, listening to the rush of water in the river below and the gentle patter of rain on the leaves of the tall trees outside coming in through the open window. I could well understand why he was so at peace staying here. His stories are all very much about images and feelings, such that his plotlines often feel rather open and inconclusive. 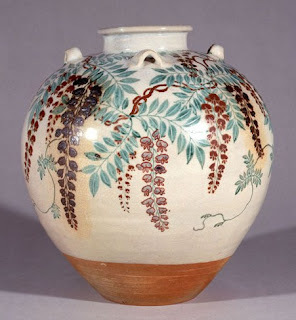 In that sense, especially given the brevity of his signature so-called ‘palm of the hand’ stories, his writings are somewhat akin to the old Edo haijin 俳人, or haiku masters, such as Matsuo Basho and Yosa Buson. Eidetic windows into a world of subtly waking thought. A lightness and profundity pinned in perfect balance. It is this quality which I admire most, and it’s what draws me to Japanese literature. I feel a deep and genuine affinity for it. I hope one day my Japanese will be good enough to read Kawabata, and appreciate him properly, in the original Japanese, as I currently do in translation. 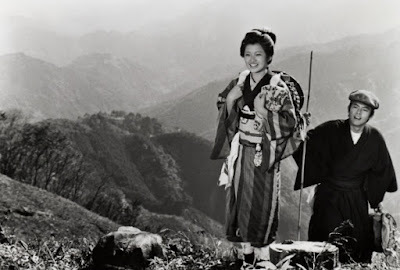 From here we bid farewell to the old lady innkeeper and her family, then set out on foot, following the path travelled in the story of Izu no Odoriko. 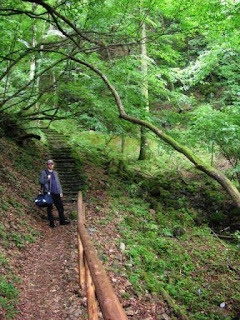 Retracing the footsteps of the characters through the Amagi foot tunnel and on along the winding trails through the forest, encountering wonderful views of tumbling waterfalls along the way. I was very much hoping to see wild monkeys, but no such luck. The most exotic things we saw were colourful bugs and caterpillars, plus a bright orange snake crossing the trail. The snake looked mightily indignant at meeting us unannounced and so suddenly. After coiling itself up into a tightly miffed zigzag it proceeded to fling itself with comic abandon from the steep drop at the side of the trail into the undergrowth far below. Eventually emerging from the forest, and now with a real appetite for lunch, we found ourselves happily at a small rustic roadside eating house which specialised in local deer meat. Here we ordered deer sashimi, and steaming hot bowls of delicious udon noodles, all washed down with a couple of much needed bin biru 瓶ビール (bottles of beer). From here we caught a couple of buses to Shimoda. Shimoda is a small fishing port and resort town set at the southernmost tip of the Izu Peninsula. It has the sleepy holiday-feel of a seaside town. We wandered round its narrow streets, finding an ashi onsen (natural foot spa), where we could dip and ease our aching feet after our day long hike. 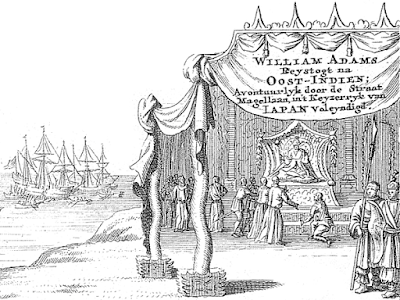 William Adams (1564-1620), is actually more closely associated with the nearby port of Itō, but he is remembered locally as ‘Anjin’ (meaning “pilot”) as he was a seafarer – an Englishman, originally wrecked off the coast of Kyushu in 1600. He was a navigator and as such he found favour with Tokugawa Ieyasu, the future first Shogun of Japan’s Edo Period. He counselled Ieyasu on matters of western mathematics, navigation, and armaments. In return he was granted samurai status and given his own estate in Miura, near Yokosuka. 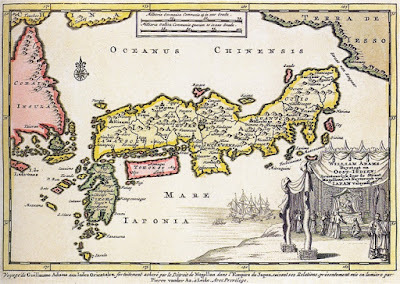 It was at Itō, just up the coast, that he constructed and launched Japan’s first western-style fleet of ships. 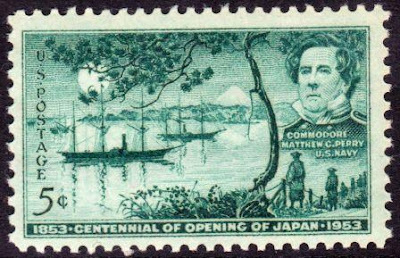 Adams himself sailed on diplomatic missions to places such as China and the Philippines on behalf of the bakufu 幕府, or Shogunate government. 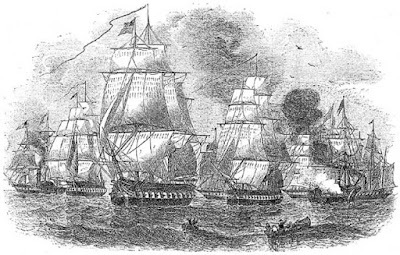 One of these ships was even believed to have sailed as far as Mexico. 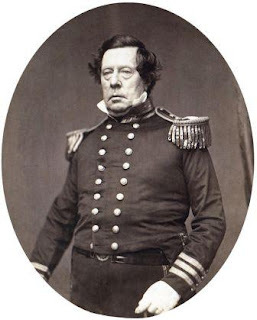 Much later Commodore Matthew Perry(1794-1858) arrived in Japan to a very different kind of welcome. 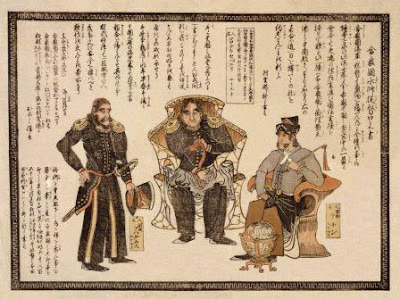 For much of the Edo Period, under the Shogunate, Japan’s borders had remained firmly closed to outsiders, but the arrival of Perry in 1853 was to force a change to this policy. 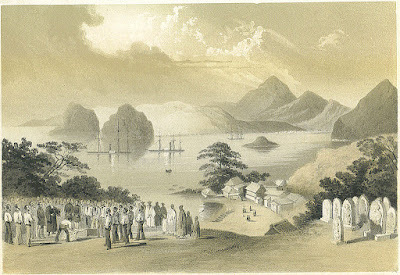 An American, Perry and his small force of soldiers negotiated a “Treaty of Friendship” that opened the way towards establishing trading rights for a small enclave of foreigners which later grew up at Shimoda before eventually moving up the coast to the more conveniently located Yokohama, not far from Tokyo itself (which was then known as Edo at that time). 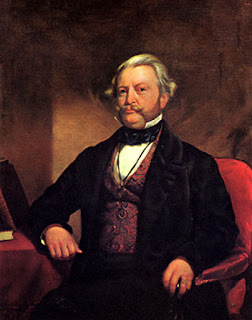 Townsend Harris (1804-1878) arrived in Shimoda in 1856 as the first American Consul to Japan. The controversial story surrounding Harris is still unclear, yet the bare facts seem to be as follows. Harris was a rather puritanical bachelor in his mid-50s who suffered from stomach ulcers. 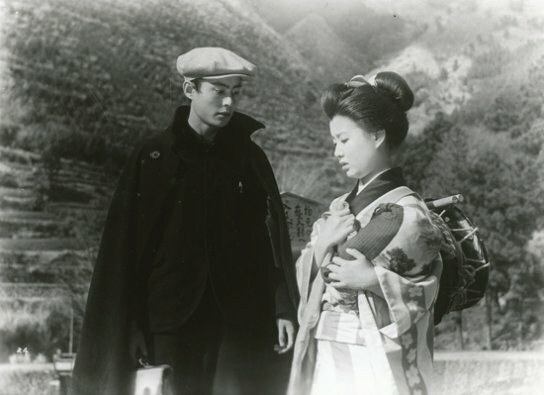 Local officials are said to have prevented a beautiful young girl of 17 years old, Saito Okichi, from marrying her intended fiancé and instead ordered her to attend to Harris – it is unclear exactly in what capacity this was originally meant to be, either as nurse, maidservant, or possibly as concubine; and it is also unclear if this was of the officials’ own doing or if they’d been prompted to it by a request from Harris himself. 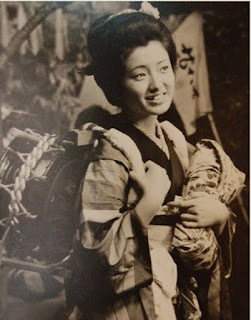 Either way Okichi was renowned locally for her beauty, and, as such, rumours soon arose regarding the nature of her association with the American. 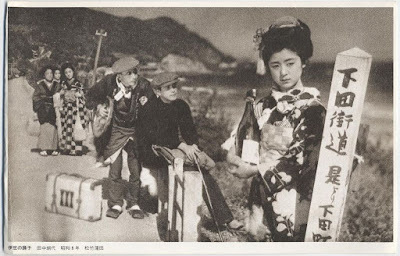 Tragically, whatever the truth of the circumstance, she remained tainted by this association long after Harris had left Shimoda, and consequently she eventually turned to drink. She did later marry her fiancé but because of her drinking he later divorced her. She tried to open a restaurant in Shimoda, but it failed soon after. She was later partly paralysed by an alcohol-induced stroke, and eventually in 1892 she drowned herself in a local river. There is now a small museum dedicated to Townsend Harris and the unfortunate Okichi. A small festival is also held every year in her memory. However, a different story has it that Harris dismissed her after just three days. The waterfront of the town is dotted with several memorials to Perry and his kurofune 黒船, or ‘black ships’, as well as monuments to Japan and the United States’ continuing diplomatic alliance and friendship. Yet wandering around the docks area of Shimoda I was more minded of the elegiac image at the end of Kawabata’s short story in which the student narrator departs for Tokyo by boat. He looks back to see the little dancer girl waving a white handkerchief. He can no longer make out her face across the distance, but he continues to watch as she waves him farewell. Izu is certainly an enchanted, and, equally, an enchanting place. 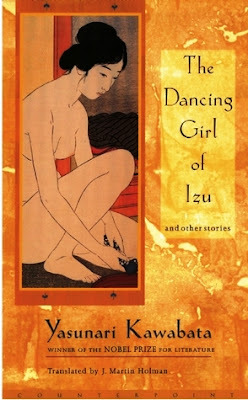 Like the story of “The Dancing Girl of Izu” my memories of this trip will stay with me forever. A lingering, long-remembered set of lost images and feelings, framed within the warmth of my heart.